I made my first zine in 2001. I can’t remember what it was called but I do remember the content was a mix up of album reviews, comics, and journaling. It was an absolute, unbalanced mess. I only did three (small) issues of that before I decided I should focus on comics. 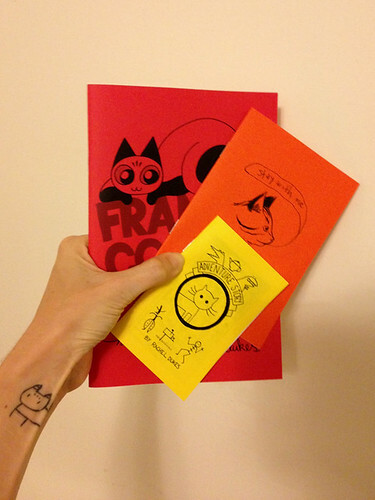 My most recent zine is Frankie Comics #1: a collection of comic strips based on interactions with my cat, Frankie. I started the strip as a exercize while I was in grad school. It accidentally gained a following online, so I’ve decided to keep doing it. At least for a little while longer. The was a comic I created last year called Frankie’s Busy Day that was about Frankie’s confusion over what “moving day” means. The art was a lot rougher than my current style but it had full bleed, colour interiors and a silkscreened cover. I built all the books by hand and was really proud of how they turned out. A lot of my recent focus has been on the technical aspects of simple, visual storytelling. Artists who cartoon simply, utilizing the grid when laying out their pages. Over the last few month, I keep going back to Everything We Miss by Luke Pearson, Primates by Maris Wicks, and A User’s Guide to Neglectful Parenting by Guy Delisle. While they’re three very different types of stories, they all successfully utilize simple visual styles to tell a story quickly and without much dialog. Which I appreciate. I spend most of my time away from my drafting table handling the day to day of self-employment: talking with clients, finding new jobs, making sure I get paid, etc. It’s useful because it lines up the work that keeps me busy, but it’s detrimental because it can keep me away from my desk for days at a time. Then, when I do sit down to draw again, it’s hard to get back into the groove. I’d love to say I spend my free time reading books or seeing movies but that takes up a lot less of my free time these days. I’m more focused on staying at my drafting table for as long as I can. 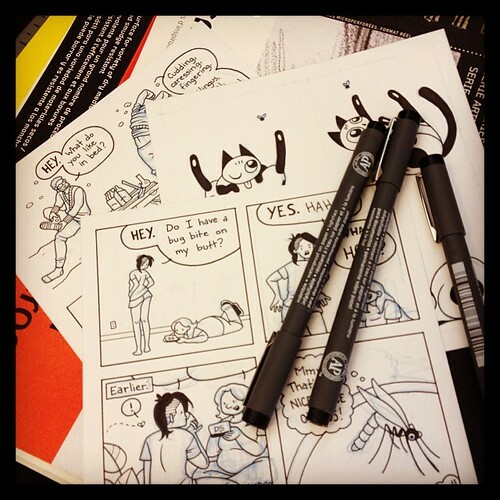 Find more of Rachel’s work at Mixtape Comics!